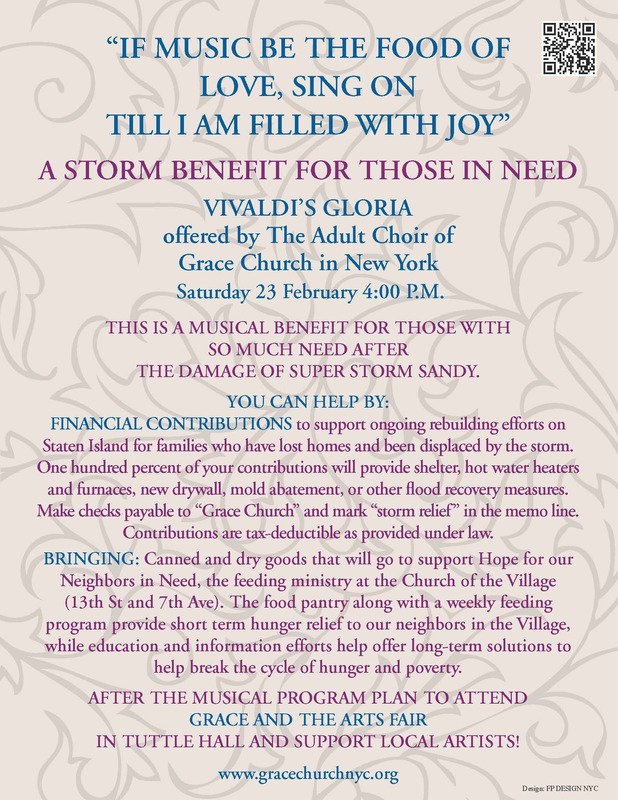 SANDY BENEFIT: VIVALDI GLORIA 23 February at 4:00 p.m. The Adult Choir will offer Vivaldi’s beautiful GLORIA on Saturday 23 February at 4:00 in the Church. This is a musical benefit for those with so much need after the damage of Super Storm Sandy. FINANCIAL CONTRIBUTIONS to support ongoing rebuilding efforts on Staten Island for families who have lost homes and been displaced by the storm. One hundred percent of your contributions will provide shelter, hot water heaters and furnaces, new drywall, mold abatement, or other flood recovery measures. Make checks payable to “Grace Church” and mark “storm relief” in the memo line. Contributions are tax-deductible as provided under law. BRINGING: Canned and dry goods that will go to support Hope for our Neighbors in Need, the feeding ministry at the Church of the Village (13th St and 7th Ave). The food pantry along with a weekly feeding program provide short term hunger relief to our neighbors in the Village, while education and information efforts help offer long-term solutions to help break the cycle of hunger and poverty. AFTER THE MUSICAL PROGRAM PLAN TO ATTEND GRACE AND THE ART’S IN TUTTLE HALL AND SUPPORT LOCAL ARTISTS!